CT scans (a simple and safe technique like an x-ray) detected lung cancer in 2 percent of HIV-positive smokers, most of them younger than 55 years old. Most lung cancers were still at an early stage, when treatment is usually more effective. 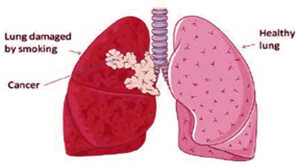 Lung cancer is the most frequent and deadly non-AIDS cancer in people with HIV. Smoking is the main cause of lung cancer in people with and without HIV, and more people with HIV than without HIV smoke. But people with HIV have higher lung cancer rates than the general population even in comparisons that take smoking rates into account. Research in the general population shows that low-dose chest CT scans reduce the lung cancer death rate by detecting lung cancer in smokers 55 to 74 years old. Because of higher lung cancer rates in people with HIV than without HIV, it may make sense to use CT scans to look for lung cancer at an earlier age in HIV-positive smokers. But detecting possible cancer with chest CT carries some risk because procedures to confirm possible cancer may sometimes have harmful effects. Also, rates of false-positive CTs may be higher in people with HIV than without HIV. To see if chest CT detects lung cancer often enough in middle-aged smokers with HIV to justify this risk, French researchers conducted this nationwide study of early lung cancer diagnosis in HIV-positive smokers without active lung disease or AIDS. The study focused on HIV-positive smokers at least 40 years old seen at one of 14 centers across France. Everyone had a lowest-ever CD4 count below 350 and smoked at least 20 pack-years (for example, two packs a day x 10 years = 20 pack-years). The study did not include people with active cancer, active AIDS. All study participants had a low-dose chest CT scan and returned for a study visit two years after the scan. If a CT scan showed something that might be lung cancer, clinicians followed the same set of steps to confirm a diagnosis. Those steps might include a biopsy, which involves taking a lung tissue sample. Lung cancer diagnosis depended on testing tissue from a lung biopsy. The main aim of the study was to determine the number of lung cancers confirmed by biopsy after the single chest CT scan. The study involved 442 HIV-positive smokers who had a chest CT scan in 2011 or 2012. The group had a median (midpoint) age of 49.8 years, and 82 percent were younger than 55. Most study participants (84 percent) were men. Almost everyone (98 percent) was taking antiretroviral therapy, and 90 percent had a viral load below 50 copies. Median lowest-ever CD4 count was 168, and median CD4 count at the time of the CT was 574. The study group smoked a median of 30 pack-years, which could mean, for example, 3 packs a day for 10 years or 2 packs a day for 15 years. Clinicians diagnosed lung cancer in 10 people. Nine of these 10 people had a CT that indicated lung cancer. That means 2 percent of this group had lung cancer detected by CT. Six of the nine cancers were at an early stage, which favors successful treatment. Two of three people with late-stage cancer had delayed procedures to establish a diagnosis after the CT scan showed possible signs of lung cancer. Three of the nine people with CTs indicating lung cancer were younger than 50; another four were between 50 and 54; and the remaining two were 56 and 58. In the nine people with CT evidence of lung cancer, smoking pack-years ranged from a low of 21 to a high of 60. Eight of the nine people with CT evidence of lung cancer had the cancer confirmed by lung tissue analysis. The ninth person probably had lung cancer, but she could not have the required procedure because she had severe pulmonary (lung) hypertension. Fifteen people had 18 procedures to establish lung cancer diagnosis, and none of these procedures led to serious complications. Among 368 people who smoked at the time of their chest CT, 74 (20 percent) had quit by their last study visit. This study of 442 HIV-positive smokers across France found that a single chest CT scan can detect lung cancer — often at an early stage and often in people younger than 55 years old. Previous research in the general population found that looking for lung cancer with CT scans lowers the lung cancer death rate in smokers 55 to 74 years old. The new study in people with HIV is too brief to measure the impact of chest CT on death. But the results show that CT scans can spot high numbers of lung cancer at an early stage in HIV-positive smokers in their 40s and 50s. And early-stage cancer is more likely to respond to therapy than late-stage cancer. The French researchers propose that using CT scans to look for lung cancer could benefit HIV-positive smokers younger than 55 who once had a CD4 count below 350. In their study the French team detected one case of lung cancer in every 49 people who had a CT scan. A CT image indicating possible lung cancer may mean a person needs further procedures that take tissue from inside the lung. But none of the 18 procedures done in this study had serious harmful effects, partly because the study took place at a center with much experience doing these procedures. Smoking is the main cause of lung cancer in people with and without HIV, and everyone in this study smoked — most of them for a long time. But it’s never too late to stop smoking. The risk of lung cancer falls by half in the 10 years after a person quits smoking. In this study group, 74 of 368 people (20 percent) who smoked at the time of their CT quit during the next two years. Other researchers figured that one third of HIV-positive smokers in the United States have quit. That rate could get higher as experts develop new ways to help HIV-positive smokers quit. For example, PositivelySmokeFreeMe, an online eight-session quitting program that can be completed by individual smokers, has had some success (www.positivelysmokefreeme.com/). If you smoke, talk to your HIV provider about making a plan to quit.